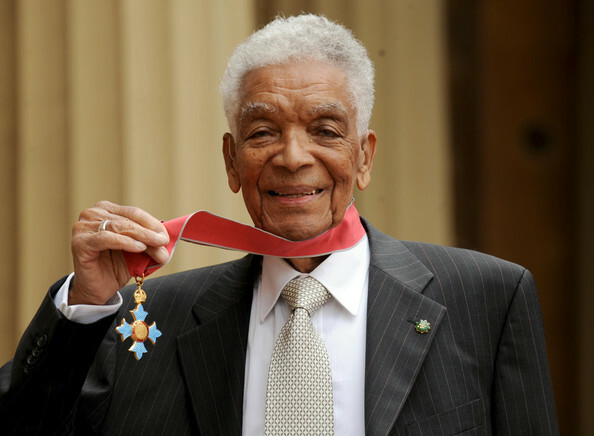 Bermudians are being invited to spend an evening with the island’s legendary actor Earl Cameron next month when the 94-year-old star takes part in the Department of Community & Cultural Affairs “Heartbeats of History” lecture series. Mr. Cameron will appear at the Bermuda Underwater Exploration Institute on April 11 at 6.30 pm to discuss his lengthy career [he is pictured here with former resident Michael Douglas at the Bermuda International Film Festival in 2007] . Film excerpts will be shown and the evening will also feature a musical solo by Mr. Cameron’s granddaughter, Siria Rutstein. There is a $10 fee for this event. Spaces is limited; please contact the Department of Community and Cultural Affairs on 292-1681 for tickets, or go to their office at #58 Court Street, 4th Floor. It was a simple yearning to see the world which existed beyond Bermuda’s shores prompted Mr. Cameron to embark on what became a life-long odyssey of self-discovery, breaking down barriers and learning. The pioneering actor who shattered the colour bar in British film and TV in the 1950s — and who at 94 continues to work in such Hollywood blockbusters as “The Interpreter” (2005 ) and ”Inception” (2010) — told “The Birmingham Post” newspaper it was wanderlust which prompted him to sign on as a crew member in the British merchant marine just prior to the outbreak of the Second World War in September, 1939. Stranded in the British capital and working at several kitchen jobs, Mr. Cameron said his trail-blazing acting career began by chance — he bumped into an actor friend from a West End show called “Chu Chin Chow” (based on Ali Baba and the 40 Thieves). Mr. Cameron joked he ought to be in the cast — and soon he was. As a member of ENSA – The Entertainments National Service Association –Mr. Cameron entertained Allied troops in the United Kingdom thoughout World War Two but did return to Bermuda for five months after the war — only to tell his mother he was leaving permanently. She said, “If you have to go, you have to go”. After performing in West End and repetory theatres throughout Britain for six years, Mr. Cameron said his breakthrough role came in “The Pool of London” – a 1951 film set in postwar London involving racial prejudice, romance, and a diamond robbery. He won much critical acclaim for his role in the film. “A girl I knew called from a film company at Ealing Studios to tell me (director) Basil Dearden was making ‘Pool of London’,” said Mr. Cameron. “He told me I looked too old, so I shaved off my moustache. I’d told him I was 26, but when he asked again I admitted to 32 and said it was ‘poetic licence’. “Actors have to tell the truth today! In one example of typecasting when I wasn’t going to get a part because I was ‘born in Bermuda’, I quickly said I was born in Ghana but had worked in Bermuda and I got it. By the mid-1950s Mr. Cameron was an established star in the UK and he worked steadily in movies, the theatre and in television. While his more recent TV credits include “The Buccaneers,” “Kavanagh QC”, “Casualty”, and “Waking The Dead”, his significant 1960s television work included “Doctor Who”, “The Prisoner” and “Danger Man”. He also starred with Sean Connery in the 007 blockbuster “Thunderball” (1965) playing Pinder, the British secret service’s Head of Station in the Bahamas –and technically James Bond’s boss during his mission there in the film. Mr. Cameron has worked with screen legends like Dirk Bogarde (“Simba”, 1955), John Mills (“Flame in the Street”, 1961) and Richard Attenborough and Jack Hawkins (“Guns at Batasi”, 1964). But Sidney Poitier – the first black actor to win a best actor Oscar (for “Lilies of the Field” in 1964) and a recent recipient of the United States’ highest civilian honour, The Presidential Medal of Freedom – remains a particularly good friend. “Sidney directed me in London in One Warm December (1973) and we still speak,” said Mr. Cameron. “He used to tell me that most big stars were either drug addicts or alcoholics so he was very sensible and stopped drinking altogether. In 1979, Mr. Cameron retired from acting to run a “little business” in Guadalcanal in the south Pacific’s Solomon Islands, where he lived until 1994 when he moved back to the UK and relaunched his acting career. While he preferred dedicating himself to his family and his Bahai faith rather than seeking fame and fortune in Tinseltown, the call to star in films like “The Interpreter” has been too difficult to turn down. Had he gone to Hollywood and not “retired” to the Solomon Islands, Mr. Cameron agrees he could have been challenging the great Morgan Freeman for roles in movies like “Shawshank Redemption” (1994). “Yes, but at that time faith was more important to me than any film,” Mr. Cameron said. “I could have played Mandela, there’s no doubt about that … And I’d have loved to have worked with Clint Eastwood, or when he was younger, Marlon Brando. Delighted to see the progress of black stars following in his wake – like the Academy Award-winning Denzel Washington and Oscar-nominee Will Smith – Mr. Cameron was asked by the “Birmingham Post” what his own epitaph would be. Mr. Cameron has revisited Bermuda numerous times in recent years, paying a courtesy call on Premier Paula Cox at the Cabinet Office in 2010. 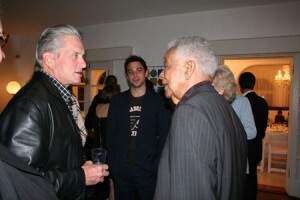 Plans were announced in 2010 for a feature-length documentary about the Bermudian actor’s life and trail-blazing career. Mr. Cameron was honoured with a retrospective of his work at the tenth Bermuda International Film Festival in 2007, receiving its prestigious Prospero Award for lifetime achievement. The youngest of six children, Mr. Cameron was born on August 8, 1917 in Pembroke. His 40-year marriage to the late Audrey produced five of his six children, and he has now been married to his second wife Barbara for 16 years. The veteran actor was named as a Commander of the British Empire for services to the dramatic arts in 2009, shortly after appearing alongside Dame Helen Mirren in her Oscar-winning role in ”The Queen” (2007). Last year Mr. Cameron appeared at a series of film screenings in London next month to discuss how the decline and fall of the British Empire was portrayed in UK cinema during the 1950s and ’60s. The British Film Institute [BFI} and political magazine “New Statesman” are partnered to present the “End of Empire” series. Held at the BFI’s Southbank facility, films in the series included “Simba” which co-stars Mr. Cameron and the late Dirk Bogarde. Set during the Mau Mau uprising against British rule in Kenya, the 1955 film screened on November 9 and Mr. Cameron led an audience discussion after it was shown. He also took part in the London borough of Brent’s month-long celebration of literacy in November. Mr. Cameron lives in Warwickshire in the UK near the city of Birmingham. more young black bermudians should leave and take residence in the other countries as this brave and smart man has……just look what a black man has accomplished so many years ago when ewart was banging his drum as a little man at his University in the states……l bet this black man could teach old Ewart a thing or two about politics and public speakings towards the people who fed him. Bermudians don’t have to leave our country to achieve success. There are plenty of rich Bermudians in all shades of colour who have become extremely wealthy and successful. Initiative, determination, motivation and drive are the keys to making money wherever you live. Young Bermudians who enter the IB field (accounting etc) and growing IT field certainly have the capability to have stellar careers. Doctors, lawyers, chefs – Bermudians do those jobs very well and the younger generation can continue moving onwards and upwards. We don’t need our future leaders to leave, we need to keep them here and provide education and jobs to nurture and grow Bermuda.